One of the sure shot ways of improving the ranking of your web site is by using back links. Good quality back links send a signal to the search engines to send page traffic to your site. In the initial years, link building was a time consuming process and it could be placed on web pages, mostly unimportant ones. Hence, it was not very useful for the internet users. However, today the deal is quite different as the search engines just do not go for any back links. The quality of the links should be high and it should also be placed on important web sites. Hence, now the process is combined with traditional content marketing with infographics or the visual things on web site. This works immensely well as the internet users are very much attracted to all kinds of visual content. Infographics basically are visual presentation of various things like data, statistics, facts, information in a more creative and aesthetic manner. It is educational and entertaining at the same time and it is one of the best ways to improve the awareness of your brand. Creating an infographic is a pretty simple process. However, you need to keep in mind certain rules while creating the infographics. Choose one topic: Do not create an infographic with many topics as it may mess it up and your message might get lost in the crowd. The visitors who are interested in it must find your content relevant or they will not spend time there. ·Add statistics and numbers: It is important to add credibility to your information by adding numbers and sources to your claim. Any data that has a research back up has more validity among the visitors. Add the source and link to your web site at the end of the infographic. ·Make it visually appealing: Infographics is all about the visual presentation. Hence, it goes without saying that it should be very attractive and appealing. Use talented designers to create it using attractive graphics, fonts, charts, logos, photos and whatever conveys the best results. Come up with new and unique ideas that can appeal to the reader’s sensibilities further. ·Share: Just creating the infographic is not enough. You have to make sure that it is visible and many people get to see it. Social media is a great platform for ensuring that it goes viral. Place the links of Facebook, Twitter, LinkedIn and Google plus and it will reach a large number of audience in a few hours. How Infographics Can Impact Your SEO? 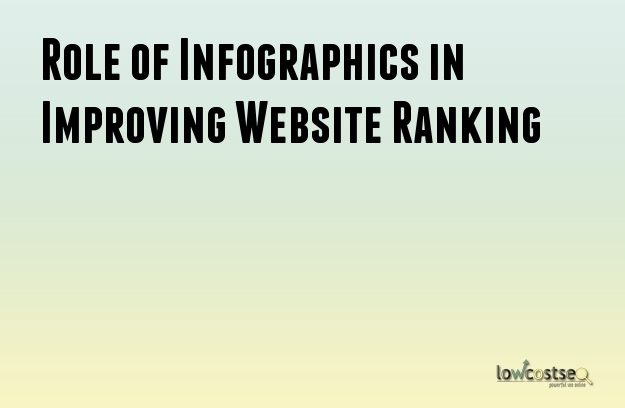 High quality infographics always give your web site a good ranking and increase the traffic to your web site. They can also create new links that can further improve the web site’s visibility. In an infographic you can also add an embed link that helps the visitors to copy past it or add it to their own web site. They become more visible in the major search engines and get a high ranking.